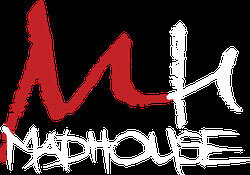 MadHouse is an Italian female-fronted rock band captained by the charismatic singer Federica Tringali. After several years of playing as a cover band, presenting to their audience some very personal hard rock versions of pop to rock hits such as Poker Face by Lady Gaga and others by Bon Jovi, U2 or Nirvana, the combo starts working on their own music in 2012. In the same year Federica decides to christen the band MadHouse, in order to highlight the existing parallelism between art and madness. Basing her lyrics on strong and direct life experiences, Federica writes numerous songs of great potential. Among these, 4 are chosen to be produced by one of the leading Italian producers: Marco Barusso (Lacuna Coil, Thirty Seconds to Mars, Coldplay). These four tracks get published in 2015 in 120 countries worldwide (under label ICM/Believe) with the EP "You Want More". MadHouse's first single and video "Empty Inside" is released in September 2015. In the video - directed by Disney Channel celebrity Jacopo Sarno - we see the band starred in a thrilling storyboard. The EP "You Want More" receives immediate recognition by critics and the single gets a considerable airplay from various FM and web radios in Italy, Germany, Spain and UK. In the fall of 2015 MadHouse put out the lyric video for "Skulls and Bones", the second single, and the video for "You Want More" third single and title track of the EP. MadHouse enter the studio to work on their first full-length this time under the artistic direction of DysFunction Productions. "MadHouse Hotel", produced by dysFUNCTION Productions, is a concept album, composed by 10 tracks where every single one of those represents a hotel room, where every listener, once taken the key of it, chooses to stay in, in order to look for his own dimension. The artwork and the photography have been entrusted to the Italian artist Ugo Galassi, while the graphic has been realized by EdyArt. I MadHouse sono una rock band lombarda, capitanata dalla cantante pavese Federica Tringali. Dopo diversi anni di gavetta come cover band, in cui proponevano versioni molto personali, in chiave hard rock, anche di brani pop come Poker Face di Lady Gaga, alternati a hit di Bon Jovi, U2, Nirvana, nel 2012 iniziano ad accarezzare l'idea di lavorare su brani inediti e decidono di battezzare la band MadHouse, nome scelto da Federica per evidenziare il parallelismo esistente fra arte e follia. Basandosi su esperienze di vita dirette e forte di un'ottima conoscenza dell'inglese, Federica scrive numerose canzoni di grande potenziale. Fra queste, 4 vengono scelte per essere prodotte da uno dei più importanti produttori italiani: Marco Barusso (Lacuna Coil, Modà, Thirty Seconds to Mars, Coldplay). I quattro brani vengono pubblicati in 120 paesi nel mondo (sotto etichetta I Cuochi Music/Believe) nel 2015 nell'EP "You Want More" e a settembre 2015 esce il primo singolo "Empty Inside" il cui video, che vede la band protagonista di un set poliziesco, è diretto dal cantante – attore Jacopo Sarno, volto noto di Disney Channel. L'EP riceve subito critiche entusiastiche, così come anche il singolo, che viene passato da diverse radio FM (e non) italiane ed internazionali. Nell'autunno del 2015 i MadHouse pubblicano il video lyric "Skulls and Bones", secondo singolo estratto, e il video di “You Want More” terzo singolo e title track dell’EP. I MadHouse entrano in studio per lavorare al loro primo full-length che vedrà la luce nel 2019 questa volta sotto la direzione artistica di DysFunction Productions. "MadHouse Hotel", prodotto da dysFUNCTION Productions, successivo all’EP “You Want More” prodotto da Marco Barusso, è un concept composto da 10 brani dove ogni singola track rappresenta una stanza dell’hotel in cui ogni ascoltatore, presa la chiave della propria camera, sceglie di soggiornare per ritrovare o ricercare la propria dimensione. La copertina e la fotografia sono state affidate all’artista Ugo Galassi, mentre la grafica è stata realizzata da EdyArt.